Mediterraneo is Back! and banging a bigger drum in support of MSF. Mediterraneo is back at Summerhall! and with the good people at Nothing Ever Happens Here comes a night that will shake your feet, bodies and souls. This time, Edinburgh’s very own celebration of Mediterranean and world music gets right to the heart of rhythm with a carnival of percussion. 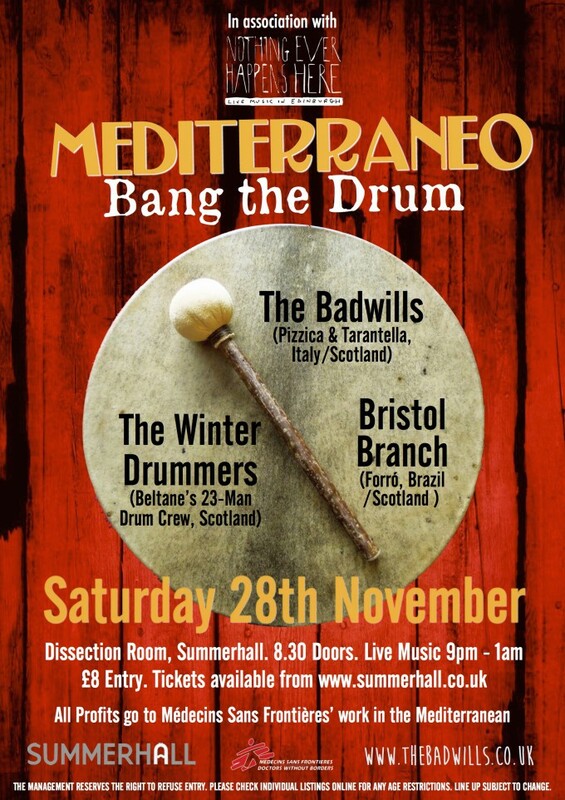 We will be playing along side two other massive bands Bristol Branch and Beltane Fire Society‘s 23 piece Winter Drummers – complete with all the drums, tamburelli, tammorre, surdos and pandeiros we can fit in the Dissection Room. All profits from the show will go to support Doctors Without Borders/ Médecins Sans Frontières (MSF) work with refugees in the Mediterranean. Tickets £8 – available online and a limited number on the door. Opening the night, straight from the procession at Edinburgh’s Samhuinn Night and glowing from the fires of the Beltane Fire Society, come The Winter Drummers, a 23-piece drum crew with a sound like unleashed thunder. You are warned: earplugs not provided! Is there anything more electrifying than South American percussion? We doubt it, and Bristol Branch will prove it with their mix of Northeast Brazilian forró and healthy doses of samba, Cajun, Baião, all with the occasional Scottish ceilidh tune mashed in. With members sharing their duties with other local world music stalwarts Orkestra del Sòl, Bristol Branch will make sure nobody in the room stands still. We will be hosting and closing the night so join us: Bang the Drum – and even more so tonight! We have banged drums before, but this time we want to Bang the Drum louder and deeper. As hosts of Mediterraneo, we could not relaunch this series without acknowledging how the sea that we love is, today more than ever, at the centre of thousands of people’s lives. At once a crossroads and a wall, uniting people and dividing them; giving people hope, and taking it from them. This is why, while keeping our words to a minimum, we have chosen to donate all profits of this concert to Doctors Without Borders/ Médecins Sans Frontières (MSF), to contribute to their commitment to providing assistance to those who are crossing the Mediterranean every day. You can see more about their work in the mediterranean at www.msf.org.uk/country-region/search-and-rescue-in-the-mediterranean-sea. Carnival time – February 6th! Our New Video is here! Pizzicarella!